PlantCraft Spreaders have finally arrived and are now becoming the top choice for domestic gardeners, commercial operators and rural property owners throughout Australia. Built to exceptional quality standards, these agricultural machineries are the common sense choice for evenly distributing grass seeds, lawn fertilizers, snow and ice-melt agents as well as other granular materials. 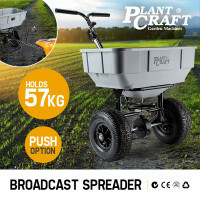 Available in 30kg, 57kg and 90kg hopper capacities, PlantCraft Spreaders are designed for more accurate coverage with their precision rate settings. Made from high quality and durable materials, they can easily, evenly and properly spread fertilizer and seeds across your lawns and gardens. With greater coverage, the development of roots will be deeper and stronger. All PlantCraft Spreaders are equipped with large pneumatic tyres that allow them to run smoothly even when used on rough and bumpy terrain. The hopper screen effectively cuts and filters unwanted clumps to ensure consistency. The application rate is also not a problem, thanks to the easy-to-use lever box that gives you full control during distribution. 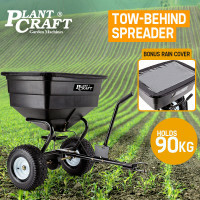 PlantCraft Spreaders are great to use in any weather conditions. Each purchase comes with a bonus rain cover and the enclosed gear box makes sure that the materials are dry and protected from the wind. 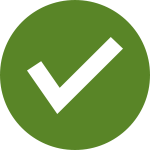 Use them by hand or tow them off ride-on mowers, tractors or ATVs. Be impressed with other main features including quad-blade impellers. PlantCraft is truly a cut above the rest as each product is made practical, durable and affordable. Boost your lawn and garden care with other high quality agricultural equipment from Edisons. Here, you can also find impressive collections of other high quality and dependable garden machineries such as Wood Chippers, Log Splitters, Post Hole Diggers, Stump Grinders, Tillers, Trenchers, Fencing and Dump Cart. With these and a whole lot more, the lives of rural property owners and farmers are easier than ever. 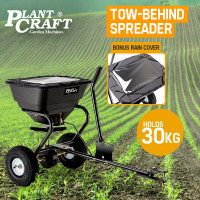 Buy a PlantCraft Spreader today and experience fast, effective and hassle-free lawn care!